in the relationships of marriage, business, love and with Mother Earth. The Earth is the home we all share. Not only can't we fool her, we can't live without her. "A summer house shared by an extended family was in desperate need of maintenance. Everyone talked for years about the work that needed to be done, but no one was taking any action. Ciera felt this was due to not being able to work together. She decided to see if Feng Shui held a solution. The room in the Partner area of the house contained a non-working fireplace at an angle. A picture of an eagle and a flag hung over the mantle. In the summer of 1997, Ciera replaced the eagle picture with one of a water scene and placed 9 seashells behind a clock on the mantle. She set her intention that this would encourage working together. The following April she got word that work had actually begun. By the following summer all the needed repairs were completed. They even put together a fund to buy new beds and began painting in the fall. The fireplace has a new gas insert and the water scene still hangs over the mantle. So, how did that simple picture of water and 9 seashells, placed with intention, yield such amazing results?" 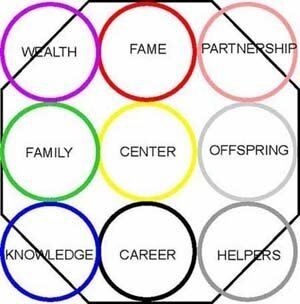 The energetic relationship between Feng Shui Elements holds a possible explanation. I like the image of the dance. In a ballroom dance two individual partners move as one to create a new form, the form of the dance, It is a one on one relationship, an intimate joining together of abilities and assets. The dance form that results is a greater expression of the energies of the two people involved. It allows the the dancers to evoke emotion and movement that neither could access without the other. To be able to experience the dance as an expression of ones full potential requires practice. It becomes imperative to be truly familiar with how the partner moves. Openly communicating feelings and desires allows the steps and movement to flow in perfect rhythm. As they grow in synchronicity, they intuitively know what the next move will be. This allows for spontaneity and an even higher vibration of this union. To watch this dance of partnership is exciting and affirms each persons capacity to be both an individual and one half of a partnership. Are you in search of a soul mate? Do you desire a business partner to help grow your business? Want to deepen your relationship with your mother? It is also helpful to consider the polarity of your relationship with yourself explained in the Knowledge Life Situation. Tip 1) Locate your Partnership area in your living space. If your master bedroom is there, that is fortunate. Use natural, organic bedding and minimize electrical fields to create a special room. If your master bath has no door it is important to change this energy by creating a symbolic door. One option is to hang 9 faceted lead crystal spheres on red ribbons across the top of the entry to the bathroom. Use a spiritual reinforcement to set your intention. Tip 2) Discovering that your bathroom is smack in the middle of your partnership area is not as ominous as other life situations. The reason is due to Mother Earths ability to transform waste into compost necessary for growth. Reinforce this life situation by placing a plant on the toilet tank and visualizing that growth. Tip 3) Your Partnership area sits in the rear right hand side from your main entry door. If you have a detached building outside in that same area, it speaks to detachment in relationships. To transform that energy use this secret tip. Measure the distance from the detached building to your house. Measure one contiuous red string in multiples of 9" long enough to be attached to both structures. This can be done on the ground, under the dirt or from roof to roof. The important secret is to connect the two buildings with the red string. It may seem odd until you consider that you have created an energetic pathway to transcend the mundane detachment. Emotions are also included in this life situation. I will share personal experiences of emotional and mental health situations made better by applying Feng Shui Secret Tips. These secret tips are in addition to necessary medical help.